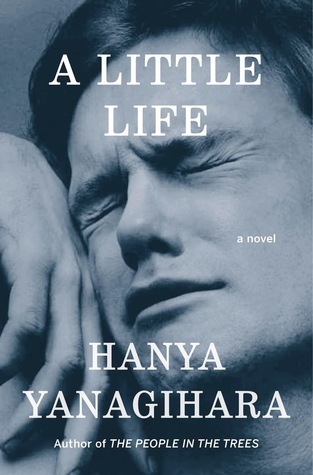 At the most basic level A Little Life by Hanya Yanagihara is the story of four men who meet in college, move to New York City afterwards to pursue their careers, and whose lives stay entwined for the rest of the novel. They can be easily defined by their careers: Willem is an actor, JB an artist, Malcolm an architect, and Jude a lawyer. It is also quickly evident that, despite his mysterious past and self-deflecting demeanor, Jude is the tie that binds this group. What is not easy and what makes this novel so profound, so reading-through-tears powerful is everything else. A Little Life is an example of the best of literary fiction in that there is a story, but it is secondary to the characters within the story. And while the novel progresses through the decades it is the musings and memories, the internal workings of each of this group of men that gives the novel an epic force. To use the word “detailed” does not begin to apply to Yanagihara’s writing. It’s not just the thoughts of each character that are conveyed, it is the blink of an eye, the way a foot drags, how one smile differs from another—Yanagihara knows her characters at a molecular level. And that is what sticks with me most, the mind, the gift that gives her the ability to see her characters so thoroughly, so completely that there is never a moment in A Little Life where one can think ‘that doesn’t ring true’. Jude is the center of the story but it is his impact on those who surround him that bring to fruition the message of the novel, for loving Jude is not easy. There are the three friends but there is also the steadfast Andy, who deals with Jude on a level the others do not know, and Harold, the professor who becomes a true father figure to him. But this was part of the deal when you were friends with Jude: he knew it, Andy knew it, they all knew it. You let things slide that your instincts told you not to; you scooted around the edge of your suspicions. You understood that proof of your friendship lay in keeping your distance, in accepting what was told you, in turning and walking away when the door was shut in your face instead of trying to force it open again. He is deeply damaged, far beyond what most of us can imagine, so brutalized as a child that he can no longer believe demonstrations of love and kindness. He could and would accept them but his mind discounts them and worries that if only the truth about him were known everything would be withdrawn. The tint of those previous years colors his very being and for every ounce of control he lost as a child he tries to take back as an adult in rituals that are incomprehensible to those who love him. People had always decided how his body would be used, and although he knew that Harold and Andy were trying to help him, the childish, obdurate part of him resisted: he would decide. Yanagihara accomplishes an extraordinary feat in A Little Life, one that can easily go unnoticed because it falls in the shadows of a mountain of inhumanity. For every year of brutality and horror that Jude endured before he was sixteen there were twice as many years of love and caring taken and bestowed after that time. In his own way, he deeply touches the lives of many, most especially his dearest friend Willem. And yet he sometimes wondered if he could ever love anyone as much as he loved Jude. It was the fact of him, of course, but also the utter comfort of life with him, of having someone who had known him for so long and could be relied upon to always take him as exactly who he was on that particular day. A Little Life poses one of the most difficult questions for a reader/reviewer: is this a book you would recommend? For those who read for enjoyment and escape, I would have to say no, simply because despite the perfection of Yanagihara’s prose and the tenderness that infuses many of the pages, the life of Jude will be too much. This is not to say that I am of such stern stuff and such an advanced reader that I was able to read A Little Life from a solely critical and evaluative perspective. No, I caution others because by the time I read the last page I felt emotionally bruised. I ached and had a mental weariness for days. This novel will weigh heavily on anyone who reads it, in the same way films such as Platoon and American History X affect those who watch them. They are important and critically acclaimed, providing a fictional look at what is the truth, but they drain even as they entertain. In the same way, A Little Life will fuse to the soul of anyone who reads it. How could he tell Harold that he dreamed not of marriage, or children, but that he would someday have enough money to pay someone to take care of him if he needed it, someone who would be kind to him and allow him privacy and dignity? If you’ve had a chance to read A Little Life, there is a great conversation about the novel going on over at The Socratic Salon. Check it out here. Yes, yes, yes! I must read this, though i still haven’t read her last book. Both are high up on my list. Ugh, even the quotes break me…especially that last one. Love everything about this, Catherine. And I think you’re right that readers searching for a pleasure read will find this is too much. I know, I had to stop with the quotes, Shannon because they were so beautiful but meant I wouldn’t write at all. I felt exactly the same way about this book. I want to recommend it to everyone because it gave me such a powerful reaction but just like you said, it might be too heavy for some. Catherine, this is absolutely perfect! Your words and thoughts are exactly how I felt-I just couldn’t muster up complete sentences. “Emotionally bruised” is exactly the right phrase for the feeling days and weeks after reading it. The quotes bring me right back to the story and the one about instincts and “scooting around your suspicions” to be a friend to Jude helped me not get as frustrated with the friends. It taught me so much about what it is to be a friend. Thank you so much! One tough read but I’m ‘glad’ I did it. I think it’s going to be a contender for the Pulitzer. “Yanagihara knows her characters at a molecular level.” THIS. And I agree that this isn’t a book to read for escapism. I don’t think a book has ever made me feel as physically nauseous as I felt while reading this one. “Emotionally bruised” is a good way to describe it. I couldn’t even do it at one stretch, Leah. I had to stop and read something else for a couple of days. Wow. I’m emotional and I’ve read only your review. Unfortunately, you need discipline for that and I seem to have none! I’m happy to read it, though!